Plantar fasciitis is inflammation of the plantar fascia, a thin layer of tough connective tissue supporting the arch of the foot. Repeated microscopic tears of the plantar fascia cause pain, usually in the heel and is one of the most common foot disorders encountered by Podiatrists. It has been estimated that over two million people each year receive treatment for heel pain, which affects as much as 10% of the population during the course of a lifetime and is present in both the athletic and non-athletic. Heel pain can affect anyone from the age of 8 to 80, but generally affects those over 40 years of age and does not seem to be gender specific and affects both feet in up to a third of cases. To be sure, visit a Podiatrist and discuss your symptoms for an accurate assessment. However the following is a guide to the classic symptoms of plantar fasciitis and gives an idea what your Podiatrist will ask about. A careful description of the pain is essential including time of day when pain occurs, current footwear, activity level both at work and at leisure, and any history of injury. The most commonly stated complaints are pain on getting out of bed, after a long period of sitting, and at the beginning of weight-bearing activities such as walking. The most severe pain in the morning occurs within the first 50–100 steps and then decreases for ordinary walking. As the day progresses, pain gradually increases continuing even after physical activities have ceased. Pain frequently originates in the underside of the heel, sometimes slightly towards the inner side, but may not have a clear focus. Frequently there is no clear ‘event’ which started the pain. The pain may be worse when the area is cold or contracted. The nature of the pain has been described as burning, aching, and occasionally stabbing. Runners may experience pain at the beginning of the run going off during the activity, and increasing afterwards at rest. There are a number of possible causes for plantar fasciitis and they often work in combination. Tightness of the foot and calf, improper athletic training, stress on the arch, weakness of the foot, flat foot, and inappropriate shoes that don’t fit and don’t offer good support are potential causes. Certain play or work actions or overuse (running too fast, too far, too soon) may hurt the plantar fascia. People with low arches, flat feet or high arches are at increased risk of developing plantar fasciitis. What do I need to do to treat it? Symptoms usually resolve more quickly when the time between the onset of symptoms and the beginning of treatment is as short as possible. If treatment is delayed, the complete resolution of symptoms may take 6-18 months or more. Typically treatment begins by correcting training errors, rest, use of ice after activity, shoe evaluation, a stretching (see bottom of page) and strengthening program and orthotics. Of all these stretching and increase in flexibility of the calf or calves is the most important and is key to a successful resolution. An orthotic is a specialised insole designed to make the foot operate in a neutral position. For people suffering with plantar fasciitis the insole will correct the pronation which is commonly associated with the condition. Pronation is the rolling inwards of the foot during walking or standing which can exacerbate the condition. Depending on the degree of correction required, there are a number of options available, from off the peg – one size fits all, heat mould-able to cast orthotics. 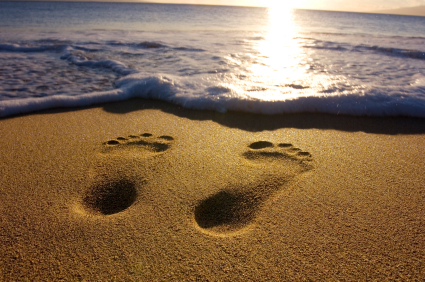 Your Podiatrist will discuss with you the best option to suite your condition. How long will it take for it to go? There is no set time for this condition to be corrected. Some people make surprisingly quick recoveries, while others notice a slower but steady progress. As a guide, between one and three months, but if you are unsure whether your progress is sufficient, speak to your Podiatrist to see if your treatment plan can be adjusted to help. Stand on the bottom riser of your stairs and hold on to the banister for balance. Move your foot backwards until only the balls of your feet are on the stair & your heels are in fresh air. Slowly lower your heels until you feel the stretch in your calves. Hold this position for a slow count of six. Do not bounce at the bottom of the stretch as this will not improve flexibility. Return to your original position and repeat ten times. For best results this exercise is best performed slowly and carefully. Stand an arms-length from a wall. Place your right foot half a metre behind your left. Fold a towel lengthwise to make an exercise strap. Sitting, place the folded towel across and around the arch of each foot in turn. Grab the ends of the towel with both hands. Gently pull the tops of your feet toward you at the same time trying to straighten your leg. If you would like to make an appointment for a bio-mechanical assessment call one of our receptions on 01628 773588 or if you would like more information or further explanation please call to speak to one of our Podiatrists.